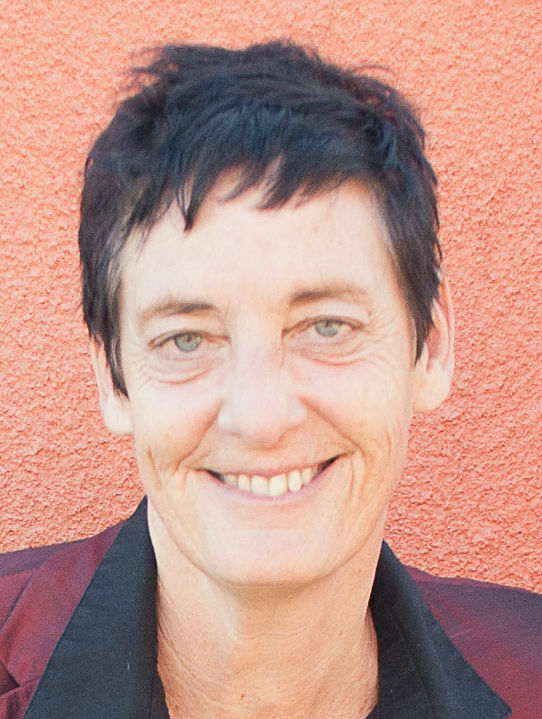 A co-founder of The Lesbian Avengers, Anne-christine d’Adesky’s The Pox Lover addresses the legacy of 1990s radical lesbian activism, too often overshadowed by the work of gay men during that era. Out June 1st, her book coincides with the Avengers’ 25th anniversary, a celebration that features a digital exhibition called Avenger 25, a national touring exhibit, which was at the NYC Bureau of General Services until New York City Pride, June 25. 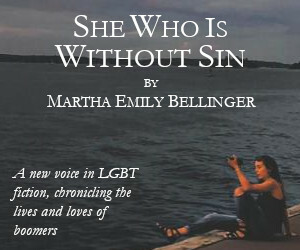 The exhibit also showed in LA (Lesbians to Watch Out For) at Plummer Park during the month of June and in San Francisco at the GLBT Historical Museum. d’Adesky is also mobilizing with Bay Area Queer Anti-fascist Network, an organization she founded, on a Chechnya #100 Vigil Action in the Castro. A pioneering American AIDS journalist, lesbian activist, and daughter of French-Haitian elites, d’Adesky’s new work draws from her journals. 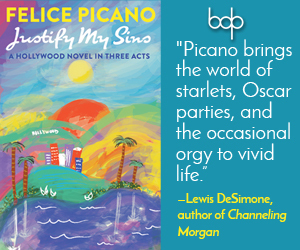 The book careens wildly and thoughtfully, like her, from NYC to Paris, from DC to Haiti. She inventories the many lives she lived while fighting vociferously for social justice issues known as Intersectional today, but not named so then. 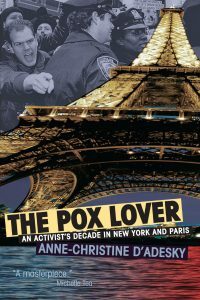 Most notably, she was a member of ACT UP/NY and ACT UP/Paris, and now reflects on the lives of comrades lost during the early plague years, “the poxed generation” of AIDS. A common affliction of those with AIDS was Kaposi’s sarcoma, a cancer that left disfiguring lesions all over one’s body, a modern-day pox. When I spoke with d’Adesky, she was settling into a new house on the Left Coast, having downsized and relocated from New York. Half the boxes around her were full of books. She now has three teenage children, ages 16, 18, and 19, all in college at the same time. Her voice was as energetic as it was 20 years ago when she was an editor giving me writing assignments. Gore Vidal remarked that each time we remember something we are remembering the last time we thought of the event. Our memory has multiple layers, a palimpsest. The book was a way of going back through my diaries. Thinking back to those days and the words I had written then. Trying to understand what happened then and present it to readers now. Doing so I also wanted to continue the conversations that we all had then. I’m hoping readers will think about where they were as I chart my way through my own life events. Readers’ moments in time are as important as mine. What sparked the founding, with others, of the Lesbian Avengers? The first feeling we had was that as lesbians we were invisible to the public. We had issues–health, political, economic–that we dealt with but were not part of the public dialogue. Yet we had done so much in solidarity with other groups around women’s health. We’d been vital parts of The Feminist Movement, ACT UP, peace movements. The time came for us to advocate for ourselves. But we also wanted to have some fun. We wanted to poke fun at the old stereotypes of lesbian separatism. Poke fun at the angry lesbian. We intentionally chose the D word, dyke. All of our public activity was a way of empowering ourselves. We had so much experience at movement organizing and politics that we began applying what we learned to ourselves. Why sleep? There was so much work to do. Humor helped you survive the 90s? Dancing, too? Oh absolutely. The Avengers would do things like create a huge bed and go down NYC’s Fifth Avenue. With lesbians romping all over the bed. We wanted intentionally to be cheeky and have fun. We had learned so much from the ACT UP visuals that later helped us to show lesbian sexuality in a public way. And I still go dancing all night long! When protease inhibitors for the treatment of HIV became available in late 1995, early 1996, was that a turning point? We called it the Lazarus Effect: people rose up from their sick beds, able to begin healing now that the combination of three HIV medicines could successfully attack the virus and reverse its effects. Before that time, AIDS was a death sentence. I remember my dear friend Kiki Mason in the book. He wrote a regular column called “Life” for Poz magazine in the early days, 1994 forward, on his deteriorating condition. Once he wrote “I’m not dying; I’m being murdered. I am being sold down the river by people within this community who claim to be helping people with AIDS.” Kiki was intense in his ways and that’s what makes him unforgettable. In interviews with John Waters, he’s said, “What’s wrong with these kids today? Not getting married and not serving in the Army are what made being gay so much fun!” What’s your take on assimilation-versus-outlaw? Nothing wrong with assimilation, but it leaves behind the rest of us who maybe don’t want to be like everyone else. The fight isn’t over. Critical issues remain that the LGBT community must address–race, class, religion–within our own ranks and in the larger community. These issues affect all of us negatively, queer and non-queer, alike. Although she did not win France’s last presidential election, Marine Le Pen, daughter of Jean-Marie Le Pen, founder of France’s far-right wing Front National party, raised hackles because of her gay male supporters. Privileged, gay men in France crafted a very effective image for her. It is a failure of the French left to not have attracted more of the gay community into its ranks. As I said in a recent Advocate.com Editorial, the election reveals evolving French LGBTQ attitudes and the movement for LGBTQ rights. It’s not a monolithic community. Many French gay voters have shifted right. (Estimates are that as many as 20% of US LGBTQ voters voted for President Trump.) The whole phenomena invites the question: What relationship does sexual orientation have to progressive values, here in the US and abroad? European LGBTQ activists have called out ambitious gay pols who’ve jumped on board the National Front’s ticket at local levels. They’ve done so, in part, because the Left parties, including the fractured Socialist Party, remain homophobic and slow to support LGBTQ candidates as well as women. As with Trump, the pro-Le Pen LGBTQ vote reflects a rejection of failed establishment political parties. What to make of US Trump and French Le Pen voters? I ask the question: Are the polished, French conservative gays vying to be local mayors all racist, fascist, self-hating closet cases? Some may be, but most consider themselves to be socially progressive and fiscally conservative: mainstream Log-Cabin types. US and French conservative gays view their nations’ economic malaise and the issue of unchecked immigration and ISIS bombings as more politically urgent than the right to marry or Congress passing a federal anti-discrimination act. In France, as perhaps in the US, they don’t know their Muslim and Arab neighbors, they feel alienated in their fast-changing mixed neighborhoods and the world at-large, and they worry about ISIS bombs. As is often the case, an ostracized group is frequently defined by their oppressors. How they view themselves takes shape as they react to oppression. Perhaps that’s what’s happening now among LGBTQ groups here and in France. How have you responded to Trump’s election? The day after Trump was elected president I started the Bay Area Queer Anti-fascist Network . We have fifteen hundred members. We put out posters and memes that are quick work bringing attention to various issues. Frank Pizzoli is a writer, editor, and producer. His work has appeared in Lambda Book Report, White Crane Review, Instinct, POZ, Rivendell’s Q Syndicate and Press Pass Q, HIV Plus, AlterNet Syndication, Positively Aware, Body Positive, New York Blade News and Washington Blade. He is the publisher and editor of Central Voice newspaper and founder of nonprofit Positive Opportunities, Inc., a Points of Light Foundation award winner (2001).